Of late, I’ve been quite distracted while spending my time reading on the internet. Whether it is a news report or a random message by an old school mate, my attention has continuously been drawn to the use of apostrophes. Ok, I’m no expert in the English language as such, but all along since learning to read and write English, I have had a particular concept regarding the use of apostrophes. Having come across at least a dozen instances in the past week which contradicted my own concept of apostrophes, I was forced to re-check whether I had been carrying a wrong concept all these years. To my relief, I found that I wasn’t wrong with my concept of using apostrophes after all. The very first thing that brought my attention to this issue was a message by an old school mate on Facebook where he wrote friend’s to call out to all his friends. I would thus like to clarify the correct usage of apostrophes to avoid such mistakes while writing. 1. An apostrophe is used to indicate ownership by a proper noun. noun follows his or her name. Example : John’s apples; India’s flag; car’s tyre, etc. 2. Don’t use an apostrophe to indicate a plural. Many friends = correct; many friend’s = wrong. 3. Don't use an apostrophe to indicate ownership when using "it". 4. Use apostrophes in contractions. 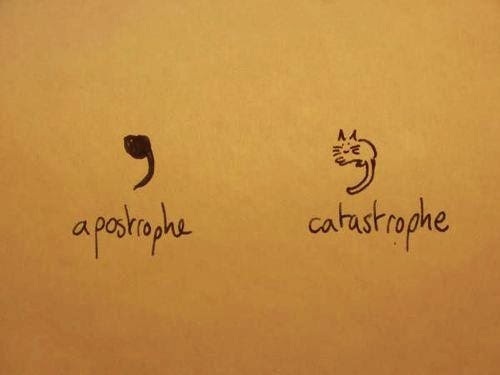 Sometimes, especially in informal writing, apostrophes are used to indicate one or more missing letters. Examples : "don't" is short for "do not"; “She’s” is short for “She is”; “It’s” is short for “It is”. 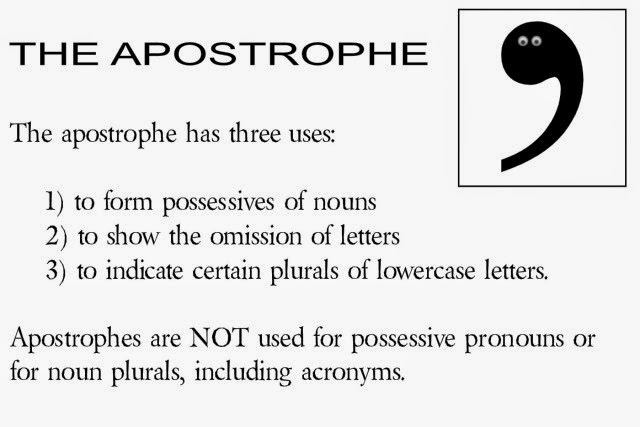 I hope this helps people to avoid small mistakes while using apostrophes when they write.